(CNS): The opposition members and the member for North Side all boycotted what they described as unlawful proceedings in the Legislative Assembly on Friday, after the premier called a meeting which the six members said was unconstitutional. For the second time in the last two months the opposition benches remained deliberately empty during the very brief meeting, as a result of the government’s decisions to bend the normal rules, orders and protocols regarding the country’s parliament. The opposition leader has written to the governor about the meeting, which was past the point of when the House should have been prorogued in order to make way for the new budget meeting. Alden McLaughlin said in his letter to the governor that the failure of the government to prorogue the Legislative Assembly was “without question” in his purview as it was a constitutional issue. “The conduct of the Legislative Assembly and the routine abuse of the Standing Orders and parliamentary conventions by the current government are notorious and well documented,” McLaughlin wrote, adding that he believed the integrity of the parliamentary process was being undermined as a result because they affect the ability of the opposition members to play their constitutional role in properly scrutinizing the government. “The present situation of no budget having yet been presented with only 2 weeks left in the current fiscal year is but another very grave example of the unrelenting downward spiral in the state of governance in these Islands. Arguably, these are all matters which are within your constitutional remit as governor," he wrote. McLaughlin pointed out that at a Business Committee on Thursday there was no news on when the budget session would be called, just two weeks away from the end of the financial year. Instead, the premier told the committee that a 6th meeting of the 2011-2012 session of the Legislative Assembly would be held Friday morning. “No reasonable explanation was provided to the Committee as to why the State Opening was not proceeding and no date was given to members as to when the Budget would be ready for presentation,” the opposition leader wrote to the governor. “When pressed, the Premier would only say that 'the budget was in the hands of our lords and masters'." McLaughlin set aside the inadequate notice to members as well as the concerns about when the budget would be delivered, but said that above all the Friday's meeting was unconstitutional. Sections 83 and 84 of the Constitution say there must be at least one session of the Legislative Assembly in every calendar year and the governor, should prorogue the Legislative Assembly annually. As the House was last prorogued on 20 May 2011 and the last session of the Legislative Assembly was proclaimed on 23 May, it should have been prorogued by 22 May this year. “That has not been done and the 2011-2012 session has expired since by virtue of section 84 of the Constitution the Legislative Assembly is required to be prorogued at least annually,” he wrote. Ezzard Miller pointed out that he was forced to boycott proceedings, otherwise he would be condoning the unconstitutionality of the meeting and described it as a “sham” and totally unnecessary. The House was adjourned this morning (Friday 15 June) after Bush made two speeches, presented a report on the term limits and moved a motion that the current government bills from the 2011/12 session be carried over to the next. However, the premier has not given a date for when the Legislative Assembly’s new parliamentary year will begin with the presentation of the budget. Although the UDP government has left its budget presentation until the eleventh hour each year since coming to office, this time the administration may even fail to make the 30 June deadline, which could present a genuine financial crisis for the running of government from 1 July. With no appropriation law passed, it will not be able to pay bills, salaries or meet any other financial obligations as it will not have the legal authority to spend public money. See opposition leader’s letter to the governor below. The so called talk show in the monring is pathetic. The host are NOT impartial- as they should be! There is nothing wrong with disagreeing anything that this or any government to come does- but do so constructively. You can hear the rage, disgust and hatred in especially Austins voice and this is unhealthy. Ray Charles can see what he is doing- he is setting his stage to run in the next election- and this is his choice and he is to be commended- but DO NOT use what is SUPPOSED to be 'neutral ground' to perpetrate his adgenda. On another note- As far as I am concerned- all of the elected members are EQUAL- a bunch of self serving, egotistical persons. I am not by any means suggesting that none of them arent worthy politicians and quite to the contrary many are but come one guys, you are paid a hefty MONTHLY salary to tend to the affairs of this country and the way it looks- you ALL, including Ezzard and the opposition need to be in a nursery school being taught manners. I dont know what will happen in the next election but I do know what I want to happen. And that is for this bunch of muppets and puppets to be replaced with NEW blood who show NO allegiance to EITHER the UDP or PPM. I know its a far-fetched wish- but I still have to write to Santa Claus, the tooth fairy and the Easter Bunnyto see if between the three of them- they can make it happen. There is something called conflict of interest which would have any talk show hosts step down if they planned to run for public office. The reporter from local television showed maturity and integridy by stepping away from his job while considering a run for public office. What some do is to delay or avoid a decision to keep themselves on air before the voters until the last possible minute. Is this right? They are hosts of a talk show not journalists on a news program so no, they don't have to be impartial. They can be opinion based. The Compass is obviously not impartial in its editorials and neither is CNS. Are Sean Hannity, Keith Olbermann, Ed Schultz, Al Sharpton, Rachel Maddow and Bill O'Reilly impartial? theyare just being idiot childish!!! they are grown up people and should work together not fighting. now we who we will trust to run the country not a bar brawl! If the Opposition which includes Ezzard don't have any solutions now how can the voters trust them to run the country? Being a radio talk show host is no preparation for political office. This country needs more MLAs like it needs to dredge Stingray City. I wish we had a few more Foollios in the house. Maybe Caymanians would be better off for it. I say we could do with a little less lawyers and pharmacist though. "Pro-rouge". Wha dat is? I da only "rouge" up in ya. You is on my turf now… Cha! From someone who is not usuay political, None of the back benchers have what it takes to put the running of the country first, they are nothing but petty little kids, far from suitable to run a country, especially ours. Next ellection if there isn't any new blood out there I say we put Macs team back in at least they have some good for the country in them. Simply put if we in the private sector think our boss is doing something wrong and we decide to not go to work because of it, we are fired… so lets fire these guys before they waste more of the country's money and time, whilst the trash our name. 21:59 I do hope intelligent people read and understand your comments, because what you say is very true. The people who are called back banchers and objecting to everything is just behaving like spoilt children, who cant have candy. What a horrible day it would be to have them run this country. I pray that there are more intelligent Caymanians, all of them Status or not, reaLize that what you say is true. When the Opposition does nothing you complain, when the Opposition does something you complain. What should the opposition be doing? If it were you in the house what would you do? Pray tell me what are your solutions? do you really think for one nanosecond that Bush would listen to any suggestions from the opposition? from the day he got in power he told the country that the opposition had nothing valuable to contribute, therefore he was not going to work with them. When was the last time the Opposition did anything positive for the country????? When they built the schools and thr roads and the Administration building. When was the last time the Gowerment did anything positive for the country. Or perhaps a much easier question to answer is when was the last time the Gowerment did anything negative for the country? Time to grow up "Little boys"and earn that huge salary we are paying you all to run this Country.I hope all of you are willing to take a pay cut in order to pay for the add ons in the House after the next elections.I for one do not think we need additional house members as it is now we cant get you all to work more than a few weeks out of the ENTIRE year and we are going to add 3 more!!!!! Peter, we voted to HIRE three more MLA's in 2009 when we voted for the new Constitution. We complain about the cost and size of government, yet we continue to approve reforms and initiatives that grow the size to an even greater extent without positive results. I agree with you however, more MLA's simply mean more agrument and posturing in the legislative assembly and LESS getting done for the people. Self Governing by Caymanians is now a total failure. When doing nothing is the best you can do its all over. They tried. They tried their best and it only proves that they are not ready yet. No lessons learned. No following rules or regulations. No auditable records. No changes for the better. No trust and no reason to trust anything coming out of Cayman Island Government. And that means every single one of them. The only thing that will keep Cayman from becomeing another Greece story is the UK. Can't blame them but it looks like their heart is just not in it. Good luck Cayman. Soon come UK rule. There is a constitution that rules us. Alden, Ezzard and the others are correct in following the Constitution. McKeeva does not believe in the Constitution, so he simply don't follow the Constitution. The only part of the constitution McKeeva follows is that the Constitution requires a Premier. He uses the Constitution just to benefit from it, but not to follow it. Big Difference. I applaud your actions Mr. Alden, Mr. Ezzard and the others in not attending an unconstitional LA Meeting. Continue to honour our constitution and to be real statesmen of these Islands. Thank You. Next election dont put any of them back in!! Does her Majesty’s loyal opposition believe that their actions provide the people who elected them and pay thir fat salary with good representation. They are well paid and yet run away from confronting the government by sitting their pampered rear outside of the assembly, their place of limited work. This type of attitude by men elected to represent who don’t even sit in the assembly for extended periods is callous,disrespectful and will not be forgotten by the people of this country. Political posturing does not provide bread on people’s tables, and neither does it solve the wrongs they so vociferously advocate, Shame ShameShame. The Governor seems quite silent on the matter. Has he not been silent on every matter? Ask yourself what could the reason possibly be? 1. He is utterly out of his depth and has no clue about what to do, so he just does nothing waiting for the golden handshake of retirement. 2. He is on a very specific mission to oversee the social re-engineering of this country and what is transpiring is exactly what he wants. He will present to his handlers at the UN a fragile nation with no identity that can be governed easily. I can confidently say that if McKeeva Bush had not been compromised and was leading this nation on the straight and narrow, the governor would have a lot to say. Politics works with cash, cold and hard, the kind our leaders like. Final question. Do you think that our governor would have been given a second term as a reward for ineptitude? I believe he has been rewarded for doing an excellent job. Duncan Taylor is a man of very high standing in the FCO. He was High Commissoner of pretty much the entire Eastern Caribbean before he came here. Do you think they would send one of their top Commissioners here to make a backward step. He is here with a fist of iron. His silence speaks very loudly. Shut up and listen carefully. He hasn't been silent on every matter. He spoke out when McKeeva attacked the Auditor General. He also spoke out against the CHEC deal as contrary to good governance. Thats because he is not a fool. like you. You all need to grow up and stop being so childish and work for these three beautiful ISLANDS we all call home. No matter what the Premier do he is talked about weather good or bad for goodness sake give the man a break none of you are prefect. Maybe you should have voted in Grownups instead children in the first place? Unless that is all you have to choose from. I am so tired of the Opposition & Ezzard whining about the government. To think they would boycott the LA proceeding is outrageous. It would be easier to accept the Opposition and Ezzard if they offered some solutions to the coultry's problems. All I hear from them is, "Mac is bad, he should resign." No alternative programs or solutions to the bloated civil service or feeding the economy. If the Opposition & Ezzard don't have any fresh ideas and solutions they should get out of the way so people with some ideas can sort things out. I am commenting to the, "I am so tired of" Yes you are correct, and every word you say is true. The Opposition needs to resign, all of them, because they are ruining this country. Cant we see that they are obsesses with McKeeva Bush. They are so Hell Bent on becoming the Power that now they are talking pure rubbish and people are tired of them. I am sure the Governor is, but he is not saying anything. I do hope he sees now who is causing all the problems. Amen to that , they are the most disgruntled bunch I have ever seen. Wonder how many times people have questioned either of their characters, this is a constant thing with all of them and I for one is sick of the bickering. Alden you started this bag of garbage that you are a part of now , so shut up and give the country a chance to move forward. the three of you are just loud mouth arrogant wolves in disguise. Show us what you can do and will do to make it better, I'm sure any high school grad can do better than what we have now, or had before, or if the bunch of you run again, God have mercy on Cayman. In any arena, performances are judged by results. Ever since the Cayman Islands were awakened out of their slumber as "the land that time forgot," led by avaricious politicians and unscrupulous business people (who were mostly the politicians), this piece of paradise has swiftly become a seeping boil on the derrière of the Caribbean. Then they have the cheek (pun intended) to refer to a lot of these people as heroes; heroes my a$$. 1. Mount Trashmore : the greatest monument to our culture and it is fitting that it should be the largest man-made structure. It testifies to our greed, our disrespect for our God-given soil, our laziness to do the messy work that actually matters and our willingness to lie down in the pigpen with rotting flesh. Environment ministers…..hello! 2. A hospitality industry where nobody ever gets to see the true warmth of the Caymanian people. Don't laugh at me. I was here in the 70s. The Caymanian folk were the kindest, warmest people I had ever met. Yes, they were a little simple in terms that they didn't know trigonometry, chemistry and physics like I did, but with life skills, compassion and respect, they blew me away. It was no wonder I fell in love with the place. The political decision making over the last 40 years has torn the fabric of this great nation and robbed the greatest asset that this country had. Now we have soulless wanderers addicted to money willing to invite all and sundry to pillage what is left of their islands for the next hit of cash. Tourism ministers……hello! 3. A third world education system. We have children coming out of the government schools who cannot read, write nor perform basic math. Education ministers….hello! 4. Rampant obesity. From the leaders down, this country is struggling with health. What did we do, promote healthy lifestyles through education? No, we (the rich unscrupulous ones) opened fast food restaurants under the noses of the most vulnerable and laughed all the way to the bank as they lined our pockets. Now we will invest in more health care to keep their diabetes under control so we can milk a little more money out of them in our pharmacies and clinics before they end their miserable existences wondering if that was all to life. Health ministers……hello! 5. Unbridalled immigration. People have always travelled and some have even settled down in foreign lands, respecting the culture, but what we have going on here is nothing short of re-colonization. I am sure Mr. Dart doesn't mind who serves him a cup of coffee as long as its done courteously. Immigration ministers……hello! My proverbial pen is tired and I can hardly see through the tears to write any more, so I'll end there. I was about to hit religion next, but I'll save it for a rainy day. To say that I have personally witnessed the death of a nation is not exactly a badge of honour that I proudly wear. Perhaps, just perhaps, there is a glimmer of life left as we hope that the hand of the Almighty sends us the wind of change that will give us another opportunity to rise up from this sickbed of selfishness. Defibrillation is a massive shock, but it can save your life! Ivan was an aspirin. Caymanian people, do not re-elect any of these deadbeats masquerading as caring politicians because those two words belong together about as much as 'friendly assassin'. Alden, stop playing your games and stand up and be counted or get off the pot. I have to agree with you on all your issues I too came to Cayman a number of years ago and I can no believe what has happened to this beautiful Island there is hardly ( if any ) of the old Cayman way of life left . My heart goes out to the Senior Caymanians to whom this current way of life is so different from what they worked so hard to preserve. And now outsiders have come in and are trying hard to distroyed it all. You are so right. I look into the eyes of the Caymanian senior citizens and I see their bewilderment at what has transpired in their home these last 30-40 years. I want to apologize, but it seems so empty. Everyone should feel safe in their home country and it appears to me that these innocent people have lost their birthright, sold out by selfish brethren, traitors even. When you lie down in your 10,000 sq. ft. mansions tonight, spare a thought for your countryfolk who work in your businesses for $6.50 an hour and may not be able to afford their light bill this month. Your answer…hire thousands of foreigners to whom that is a fortune to keep your greedy pockets lined. I am utterly disgusted at the lack of integrity displayed by the leaders of this country. Shocking! Utterly shocking. If God doesn't sweep you all out, He will have to apologize to Noah. I am glad I'm not in your 10,000 sq ft mansion tonight. I prefer my 1200 sq ft apt for which I can barely pay rent. Just another excuse by the PPM and Ezzard not to go to work. We, the people, should demand that they give back their pay for every day they have not shown up for work. They couldn't do that in the private sector and get away with it. They need to stop, whining and get off off Austin's soapbox and start doing something. I can hear McKeeva preaching now during the upcoming campaigns that they didn't do anything but spurt their mouths off with Austin and never even showed up for work. Sadly, for once he would be telling the truth. So tired of these "has beens" and "no it alls." Where is the fresh blood Cayman? 11;59 Cayman needs to stop listening to Austin's Soap Box. I do not listen to it any more, because it is nothing of a good nature. What a disgrace to the people of Cayman. I never thought that show would turn out to be this way. But truly speaking Austin and Gilbert, you all need to listen to yourselves talk. What a shame. Caymanians calling in making a proper idiot of them selves, if they hear themselves talk they would not call. Good Grief. So is that your excuse for ignoring the matter at hand? Would you be saying the same thing if there was any other opposition by ignoring what the Premier has deliberately done? I somehow don't get that tone coming from you. Hint – sometimes it's really better keeping our comments to ourselves especially when it does not make any sense. This is no surprise in so far as the opposition is concerned. Could have seen this coming a mile ahead. We should all know by now that anything that the Government proposes or does will be boycotted by the opposition. And pretty much everyone else. Oh come on, Alden and his crew (along with Ezzard) is getting too petty now!! If this is a political stunt, or should I say, another political stunt, it won't help the PPM. Alden's arrogance is too much for me to take, and I will not make tha mistake a second time for voting for him as learder of the PPM. This is so true, the opposition will whine about everything. Its ridiculous now, they same to think that they have the answer for everything and that we are all behind them, wrong guess boys. we are fed up with all of you, just seeking titles and having your mug shots on T.V. Stop whining and do something, show us what you 6 have done in the last 3 years, I'm so tired of listening to your blarney I'm going to buy ear plugs now. If you don't stand for something, you'll fall for anything — good on you Alden, show Mac and company you will not be a part of their charade. Since when has this Government needed "legal authority to spend public money"? Great theatrics fellas. How about "we the people" not pay the MLAs that continue to fail to show up for work? To 22.03 Perhaps we should charge those who break the rules and waste the public's money. That is the bigger problem. There is a constitutional process to do this. Start a petition to have the current Premier step aside. The petition can only be signed by registered voters, and needs 50% support. Everyone whines, but then nobody does anything about it because they are afraid to put their head in the crosshairs. Actually, there is no constitutional provision for recall. It would be suicide for persons to sign a petition to remove Bush especially as it may not succeed and the govt. would not be bound by it. Don't criticise people for being afraid to sign such a petition while you post anonymously on CNS. It is hypocritical. I na do anything cause I work for gowerment. I dont know who else is but I am tired of the opposition making mountain out of every Mole Hill. 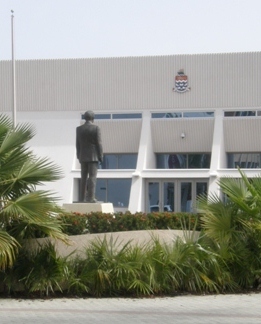 If the people of Cayman is not tired, and the Governor is not tired I know I am. Every time you turn on the radio or open the paper they are at the fore front objecting to every dot on the map. Please guys, can you work with something? I am sure your followers are completely lost following you all. If the government is allowed to circumvent the constitution when they feel like, should the people follow likewise? it is so hipocriticalof the UDP to up hold the constitution when it benifits them, but totally overlook it when it "hinders" them. that same constitution that you say the UDP broke, that was brought to us by the lame PPM party. I dont agree with the UDP, bypassing the constitution, as bad as it is its the law, BUT, the same people that are whining and shooting their mouth off is the ones that gave it to us, so we are damned if we do and damned if we dont. Thats what we have to look forward to, so come 2013, show these bigger than thou idiots who we are, change their course. Dont vote for any of them. That might make you feel good, 13:41, but it would accomplish nothing. Mac and the Micky Mouse Gang up to tricks again. OK, MLA Elio you have one week to provide an answer to justify violating the Constitution. I will wait to hear you verbage next Friday. mickey mouse wears a udp wrist watch……. Good luck waiting for HIM to provide a straightforward answer! Between the spinning of his rebuttals and the dancing around, but never directly answering the questions, you can see why McKeeva loves and depends on him. "A chip off the ol' block". I am simply sick of reading these guys ramblings with no alternate solutions, stop whining about the current leaders and start trying to convince the people that you are what’s best for cayman. What will you do if you are put in charge? It is about time the opposition got some balls. I'm happy to see that they have finally stopped taking crap from MacGadafi & his little yes-wimps. I support their boycott because MacGadafi & his UDP cohorts have been doing this for years. Now let's get rid of the UDP members before it is too late. We are on the very edge of destruction because of MacGadafi, it's time to go! When the PPM start offering some solutions to our economic situation maybe then I can give them some credit. They have done nothing but oppose and should not get back in at all. I was going to Vote Yes for OMOV but even that they screwed up for me when they walked out of The Legilative Assembly and conducted their disrespectful mockery of our system just because their item "No Confidence Motion"was not the first on the Agenda. Just goes to show that is all they want is to get rid of The Premier. Sorry not going to happen. He has more support than they think. They are so out of order it makes me sick. "in the hands of our Lords and Masters" – I mean this man is the most uncooth being ever, but MacFoolio is close behind! Trust me, real disgusting! I don't blame the opposition. Its about time they stand up to the bully! There is no way that the udp Government can just suddenly decide to call a House meeting with such short notice and especially late. This has to stop as the Premier and his little babies, feel that they can do what they want and how they want and everyone must sit down and accept it. Well CONGRATS to the Opposition & Independent members for standing up and trying to get things back to normal and to how it should be run. "Time longer than rope" and even though the udp rope has been pretty long, the end is very close!